Hello, How can I delete a poster version that's incorrectly cropped? In the profile for Mosul film , there's a cropped version of the poster and the original next to it. I'd like to leave only the original. Thank you! Hello, How can I delete a poster version that's incorrectly cropped? A link, technical info (backdrop or poster, language, size, uploader) or a description of the bad image (e.g. the DE poster with the pink elephant) is necessary. Then press the green report button on the bottom-right corner of that pop-up window. 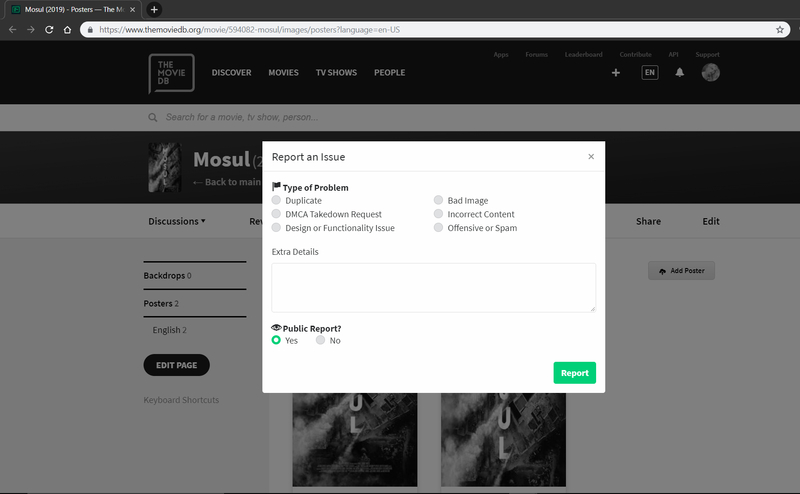 Your report should be dealt with by a moderator within 2 months (though often reports will be dealt with much sooner). If it has not been responded to or completed by a mod within 2 months, then you can "bump" your report. Btw, an image will only be removed according to TMDB's guidelines, which you can read about here and here. Hello, How can I delete a poster version that's incorrectly cropped? 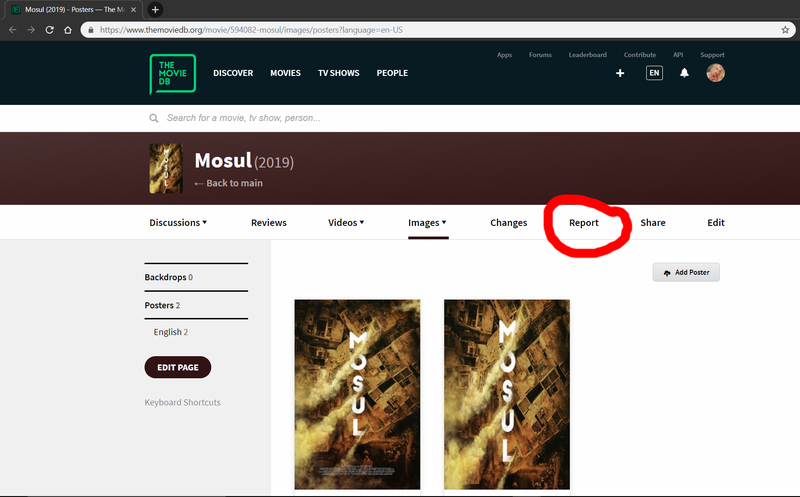 In the profile for Mosul film , there's a cropped version of the poster and the original next to it. I'd like to leave only the original. You mention the image poster you uploaded being a "cropped version" of the original poster. At first glance, I suspect that that poster has been distorted; did you resize the original poster without maintaining its proportions? If so, then the image should be removed (and you would be correct to report it).